Grey things don’t normally engender excitement. Grey is the colour of school socks, toilet roll tubes and accountants’ worsted suits. But here grey is also the colour of one of the most eagerly-awaited bikes of 2014: Honda’s all-new, completely revitalised and reinvented CBR. But if the colour of this world first test bike, the machine we’d prised out of Honda’s grasp just the day before, left us a little underwhelmed, within moments of my first ride, it was clear little else would. The plan was to take this new machine on a big trip down memory lane. The CBR after all, in all of its four previous 600 guises, is a landmark machine; a bike that was not only hugely popular and significant throughout the Nineties and Noughties, but one that pretty much defined a generation. So we decided to head to Silverstone, where a reunion of all five models had been arranged. This world first ride tells the tale of that ride over; the reunion and the return: the return of the CBR. I guess I’d known for months it’d be good. Being the faired brother of the already-launched CB650F (which I’d tested extensively in Spain in March and predicted as one of my bikes of the year) suggested the CBR version could hardly fail. What I’d forgotten was how refined and ridiculously easy to ride Honda’s all-new 650s are as well. It shouldn’t have been a surprise. 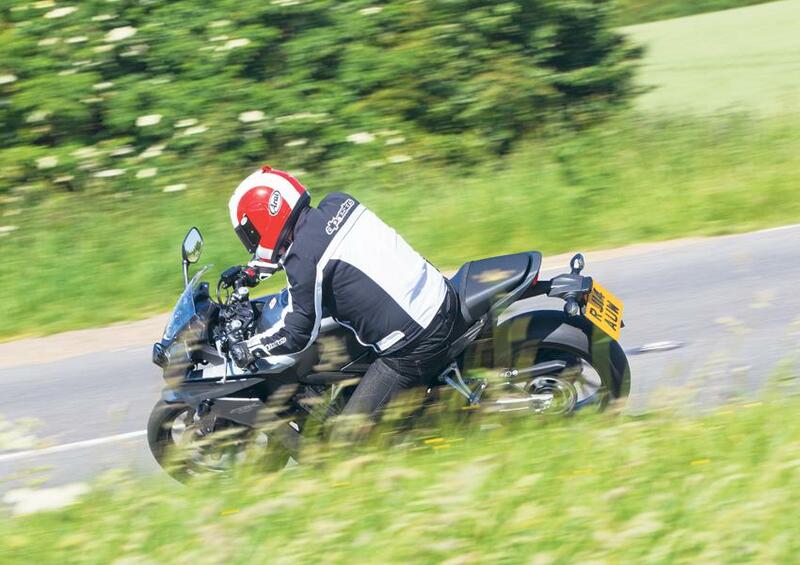 Though an all-new bike, the newcomer does have over 20 years of development under its belt. What that means for the CBR is a machine that’s comfortably proportioned and easy-peasy to feel instantly at home on; one that has a completely natural and CBR-familiar sports-touring riding position, and one that, if anything, is lighter than you expect so is an absolute doddle to manoeuvre. On the move it gets better still. The gearbox and clutch are both snickety light; the throttle response immediate and, though no grunt-meister (however ‘meatier’ it may be than old, the new CBR is still, ultimately, a middleweight four characterised by a free-revving, uber-smoth delivery) it pulls away easily from minimal revs. 3000rpm does the job and from there on the new CBR builds utterly predictably. If you want to potter and travel, 3-6000rpm is ample; a bit bolder and brisker will have you opening its lungs more crisply to eight. And if you want to thrash back and forth between country corners nine to 10,000 delivers enough hooning, howling fun to satisfy most. None of this is surprising, and it’s impossible to rate the benefit of the 50cc increase without a direct side-by-side comparison with its predecessor, but instead it was the new CBR’s chassis that impressed the most. I hadn’t been expecting much to be honest. Although decently effective in CB roadster guise, on face-value the newcomer’s suspension is a grade down on that of its predecessor. Where the outgoing CBR600F had multi-adjustable inverted 41mm forks the newbie has RWU, non-adjustable versions, presumably to save money. Even so, and with spring and damping rates wound up a little stiffer than on the CB, they worked just fine, complimenting the beautifully precise steering. Honda reckons its newcomer is much stiffer around the headstock and its CofG is more forward. At the same time, its geometry is slightly lazier than before. Cooking’s not my forte but the recipe certainly seems to work. 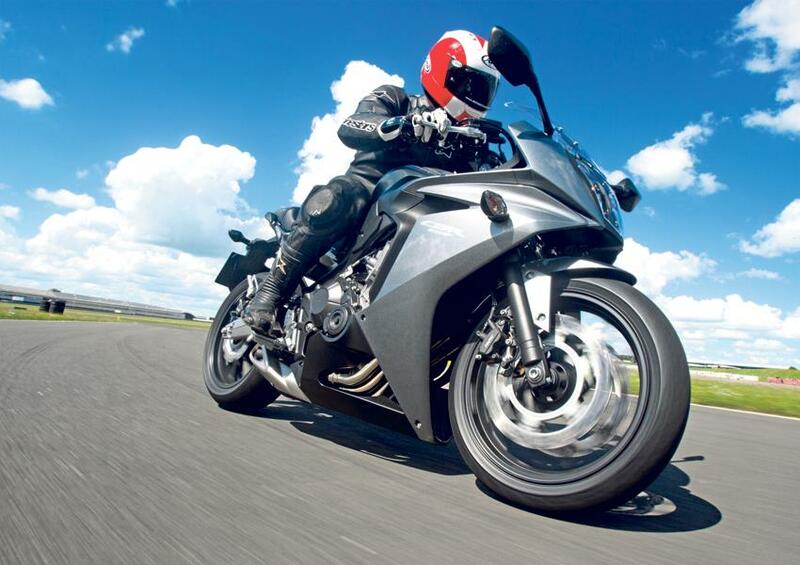 The new CBR is a doddle to ride normally: light, stable and easy. And yet, when you wind up the wick, is both rewarding, engaging and never particularly gets out of shape. I had a blast. The drag west on the A45 towards Silverstone was the perfect opportunity to assess the CBR’s distance ability. CBRs have always had more class than most middleweight all-rounders and, though no VFR, this latest version has enough to please. 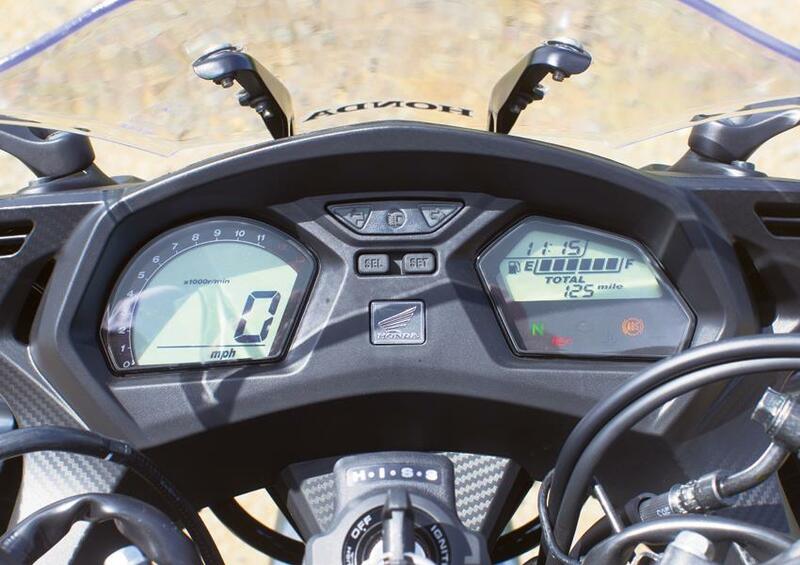 The twin LCD displays, though hardly cutting edge, are an improvement on the last version’s single LCD sweep, and with clock, fuel gauge, trips, tacho, and speedo, they lack only a gear indicator. The faux carbon inner fairing panels look good; fit and finish, though built in Thailand, as good on this evidence as any of Honda’s Japanese-made wares. As for comfort, after an hour I arrived at Silverstone no worse off than when I’d started. At the Stowe Complex pit garages we’d arranged a reunion of four of the CBR’s landmark predecessors: the original ‘jellymould’, the 2nd/3rd generation F2/F3 DAI, the ally-framed F4 and 2011’s revived CBR600F: over 25 years of Honda’s class leader. Three things stuck out: first how clunky, heavy and old fashioned the earlier bikes, with their fat indicators and skinny tyres, all seemed – the newbie looked as lithe as a greyhound alongside. Second, how consistently Honda has retained the CBR’s practicality through all its incarnations: usefully wide mirrors, decent equipment and comfortable (for two) riding positions are just three constants, so yes, the CBR DNA lives on. And third, perhaps most tellingly, despite similar appearances, how utterly different the new 650 is to the old 2011-13 variant. I’d been among those quick to dismiss the newcomer for being too similar to the old, a mere evolution. I couldn’t have been more wrong: everything is new; wheels, suspension, frame, engine, bodywork, the lot. The fact that Honda has managed to move things on (side-by-side, the new is far better looking than its predecessor) and yet maintain the CBR’s classic qualities is credit indeed. I was sceptical. Now I’m converted. After another hour or so thrashing around the short Stowe circuit, revelling in the CBR’s ease and precision, it was time to hit the commuter gridlock back east. I don’t think I’d rather have been on any other bike. The CBR’s slim manageability helped it slice through traffic; its slick controls and good mirrors making self-preservation easy, its great ergonomics and comfort cossetted my aging bones for over an hour and, when the roads opened up it was still brisk and engaging enough to be a giggle. 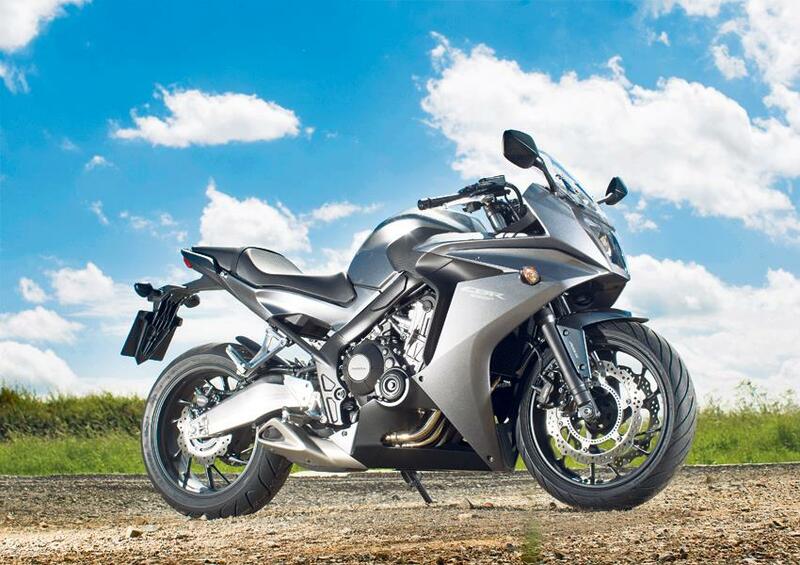 The new CBR’s not perfect – no bike is. The snob in me envies the adjustable forks of the old; the steering lock’s a little restricted, clocks a little cheap-looking, and Honda’s new generation switchgear, with indicator and horn reversed from the norm, still annoy. But these are details. The original CBR was such a success simply because it was a good, affordable, all-round bike, with a touch of Honda class. Just as much is true of this newcomer. Whether as big a market exists for it as in its 90s heyday remains to be seen, but either way its return is great news for everyone. Whatever its colour.